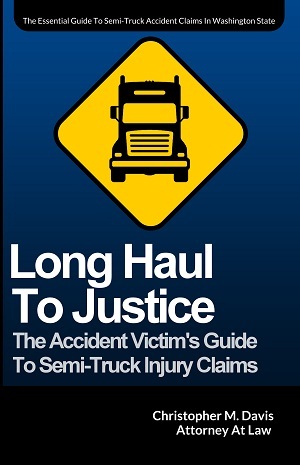 Our client unfortunately was involved in an truck accident, injuring his shoulder in the process. When the insurance company decided to play hard ball, our client came to Davis Law Group, P.S. He was impressed by attorney Chris Davis and the straightforward style of the legal staff. In the end, he says he'd recommend Davis Law Group to anybody. Going back to my office down on Lake Union, going down Stone Way, I don't know this guy just pulled right in front of me. Out of nowhere there's this big box van and I didn't even have time to hit the brakes. I T-boned him. I called the insurance company. I told them, "My shoulder's really hurting. I need to go see a doctor." She said, "Well if that's what you need to do." Right then I thought, "This isn't good." I went to the doctor and he recommended me to physical therapy and they put me on light duty at work. It just wasn't getting any better. Finally, they said, "Go get an MRI." Well as soon as I did that, the case was over. I was getting operated on. After I did all this, the insurance company called me and told me they would give me $40,000. By then I already lost darn near that in wages. I said that's not enough. I saw Christopher Davis' ad on television. I go, "That's the guy I want." When I first met him, he was very professional and I go, "This is my guy. That's all there is to it." You just get the feeling that this guy looks you right in the eye and tells you, "This is what I can do for you." He didn't give me any promises of a big settlement, nothing like that, but that we're going to try and help you out the best that we can. I go, "I think I'm in good hands." I would recommend him to anybody, in all seriousness. Not for a commercial, but to help him out. These insurance companies, buddy, you better have your ducks in a row when you're dealing with them. They certainly do. I know nothing about this type of business. Give it to the professionals. But yes, I recommend him to anybody. Hopefully they don't have to go through this.